Remember when Movie 43 first came out and horrified audiences with its one-joke sketches that went on far too long? 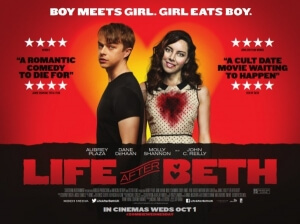 Now, that’s not to say that Life After Beth – the directional debut of I Heart Huckabees writer Jeff Baena – is as inconceivable as that celebrity-filled train-wreck, but it retains one of its many gripes which was the dependability on one simple joke to succeed and nothing more. The joke this time? It’s a young couple going through relationship difficulties… but she’s a zombie. That’s it. That is all the humour of the movie right there, summed up in a short sentence. No other actual jokes required, it seems, because they think that’s all they need to make a comedy. Well, no, it isn’t. You need so much more than just that. As the film goes on, you’ll start to notice that there aren’t many funny things happening or even being said. John C. Reilly and Molly Shannon, as the parents of the deceased titular character, are well-known comedic actors (hell, the latter had a long-standing run on Saturday Night Live) but are given almost zero humorous lines or even characters to work with. The overall atmosphere is quite dark and not that pleasant to look at, with little charm to back it up. Even Baena’s direction can’t raise the mood, constantly using shaky-cam in scenes where it’s not even required (because we’ve always wanted to experience a family dinner through the eyes of someone with Parkinson’s) and neglecting to insert any enjoyment into moments when the characters are experiencing joy. No, the one thing that the film is so desperate to have you believe is that what it thinks is its one legitimate joke is the body, heart and soul of the movie. The problem is, when you do that, the joke can get old faster than you think. To keep it fresh, you need to put the effort into thinking up some additional lines of humour or other comedic situations; don’t just rely on the one-trick pony that is your only joke to be all the humour you need to tell a good story with good characters. Having only that makes it a rather boring and unenjoyable experience for the viewer, who will have probably figured out where it’s all going about halfway through. Unfortunately, the characters are just as ill-conceived as the paper-thin premise they’re working around. Reilly is given the bulk of material out of the two parents, but while it’s understandable that they do not wish to have their “resurrected” daughter wandering about the town and scaring the townsfolk who think that she’s dead their motives come off as controlling and just plain selfish. The strand of unlikable characters stretches to the family of our audience perspective, Dane DeHaan’s Zach. His mother (Cheryl Hines) is irritatingly vapid and – once again – unfunny while his father (Paul Reiser) barely leaves an impression, but by far the creepiest and most hateful is Matthew Gray Gubler as Zach’s older brother Kyle, a neighbourhood security guard who takes his job far too seriously and obsesses over to the point where it’s borderline psychopathic (on two separate occasions, he threatens to taze and shoot point-blank his own, living brother. What a charming, delightful character…). Thank goodness for Anna Kendrick, who shows up briefly as a childhood friend and, despite the film having absolutely no idea what to do with her, works her way around an underwritten part with her natural on-screen charisma. Sadly, though, it’s a mild rose in the thorns. Perhaps the most crucial mistake, however, is the underdevelopment of the main relationship between DeHaan’s Zach and Beth herself, Aubrey Plaza. Though it’s clear that the latter is giving it her all in the role, especially in later scenes where she must convince in a fully-zombified state, Plaza can’t seem to work around a shrewdly-written role which requires her to be as manic and passive-aggressive as possible, “because y’know, she’s a zombie? Get it? Please, get it,” you can hear the movie desperately pleading for you to do. The thing is, however, that the film picks up after Beth’s initial passing at the hands of a venomous snake bite, and from there goes forward without so much as a glimpse at the past. We are told very little about their relationship before she died, aside from that things weren’t going so well which can only get you so far in terms of explaining a relationship to us. We never see them together prior, so we don’t know if there really is a connection between them if any at all. It leads to the audience not caring in the slightest about what happens to them, because the movie doesn’t give us reason to care. There’s no room, it seems, to fit their turmoil and human connection in between the one joke that the film is so painfully trying to cram down your throat. It doesn’t even seem like theirs is a romance that could last, because they both seem uncomfortably clingy and creepy in their obsession over one another (even if one of them is undead). It’s a shame, because it seems that there could be a decent, funny movie to be mined from all of this. Perhaps a bit of a polish on the script (in which actual jokes could be added), and Life After Beth could work. As is, it’s a painfully-overstretched comedy sketch that offers nothing aside from its one, tedious joke. “Because she’s a zombie! It’s funny!” You can smell the desperation all around you. Life After Beth relies far too heavily on the one joke that Aubrey Plaza’s titular character is a zombie, and offers nothing else in terms of characters, romance and jokes. It’s the sort of movie that should stay where it belongs and how it should be: a three-minute sketch on CollegeHumour.com.